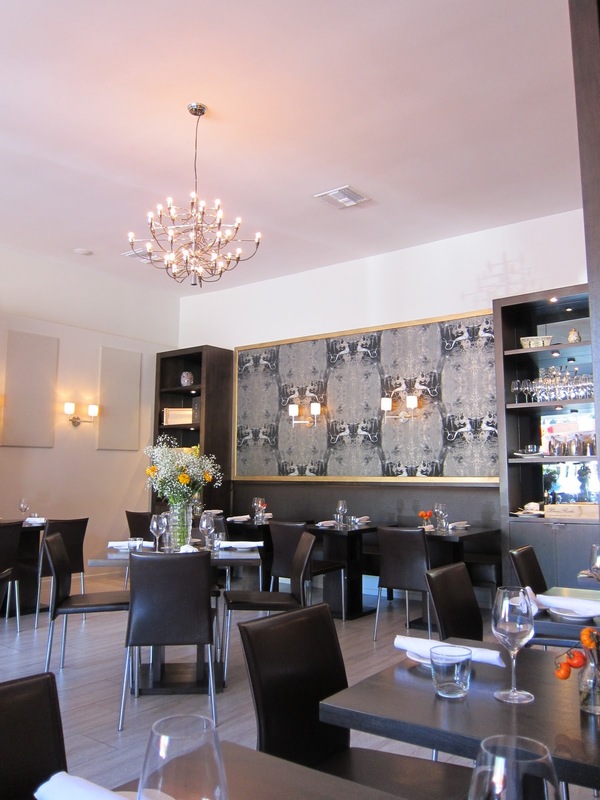 After discovering this gem of a lunchspot in Studio City last dineLA (well, we ended up ordering off the regular menu that first time, but dineLA was the reason we'd gone there! 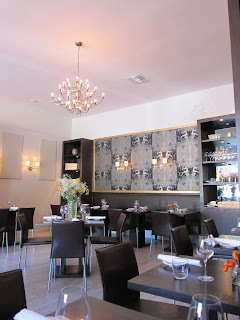 ), we'd been back to Ombra numerous times - and after looking at their dineLA menu for 2012, just had to go in for another fix. Especially for the $22 lunch deal (savings estimated at $17)! 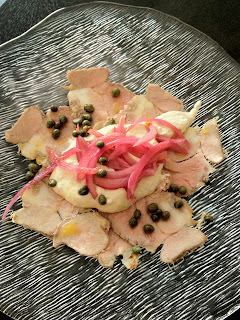 I started with the Vitello Tonnato Sliced Veal / tuna sauce / pickled onions. Beautiful slices of young cow (eloquently described, I know) - with texture somewhere between chicken and turkey, and a mild taste that I would say would be a cross between chicken and beef, are punctuated by shreds of sour and crunchy, vibrantly pink pickled onions, and capers, and counterbalanced by giant dollop of creamy tuna sauce, a completely unexpected combination that works surprisingly well together. The sour flavors were a perfect way to whet the appetite at the start of the meal - I ate every last bit and wanted to lick my plate. My friend 'Wise' chose as her starter, Zuppa di Baccala Stewed salt cod / gaeta olives / potatoes / light tomato broth. This seemed to be sort of a more exotic take on minestrone. I liked the taste of the salt cod in the tomato-based soup-stew, but in texture it was a bit muscular / tough. Fellow luncher 'Wonder' went for the Lenticchie e Burrata Brown Lentil Salad / Quinoa / Burrata. I had a taste and wanted more variety of flavors, colors and textures in this one. Lentils and quinoa don't really excite me on their own, so for me they needed to play sidekick to another ingredient that would be the superhero. As it was, this felt like a side, or a work in progress - waiting for something else to come in and save the day. As it was my last week at my old job, I guess we got too absorbed in conversation while ordering to notice that we'd all gotten the same entree, which was a shame as I'd actually wanted to try the ones with truffle / bottarga! In any case, all three of us got Polpette di Cinghiale Wild Boar Meatballs / soft polenta. I really wanted to love this, but while the meatballs were juicy and tasty, the polenta was much too salty and dense where I wanted it to be light, creamy and mild to let the wild boar take center stage. Since I knew I was starting a new job on the Westside this week, and would not have another chance to revisit Ombra for lunch during dineLA, I went back on my own another day to have the veal again as starter, and then to try the Tortelli di Patate Blu e tartufo Peruvian potato ravioli / butter / parmigiano / black truffle. Here's where I remember why I love Ombra so much - Chef Michael Young delivers simple pasta dishes that are incredibly well executed, but with some unexpected ingredient that makes eating at Ombra a fun culinary discovery. Instead of the usual meat or seafood, Chef Young filled these ravioli with Peruvian potato, which offered a beautiful bloom of purple wrapped inside each freshmade dough wrapper. Served at just the right heat to maximize the aromas of the simple yet delicious butter and parmigiano on top, raised to another level of food-euphoria with slices of fragrant black truffle. For dessert, all three of us went for the Budino di Pan D'oro "Pan D'oro" Bread pudding / salted caramel sauce. A rustic preparation of a classic dessert, but one of the best I've ever tasted - soft, fluffy yet substantial, served at perfect temperature, skillfully controlled sweetness offset by bursts of salt. I can still taste it in my mind a week later. On my return visit, I reluctantly dragged myself away from the bread pudding (since it was going to be added to regular menu) to give the Strudel di Mela e papaveri Apple and poppy seed strudel a try. I enjoyed the slices of apple that tasted poached, and loved that instead of the usual cinnamon, Chef Young used poppy seed for flavor. My only note on this was that the dough could have been more buttery, flakey and less tough to cut through. Loved the light, airy whipped cream on the side as well. Chef Young actually made his rounds in the dining room on my second dineLA visit, to chat with fellow diners, and perhaps it was seeing my eyes light and blow up to an unnatural size every time another dish arrived - but Chef Young was kind enough to send out a complimentary plate of a dessert from their regular menu: Bonet Piemontese ($7 on regular menu) which I absolutely fell in love with. The menu description says "typical Piemonte chocolate dessert / amaretti cookies". I have never been to Italy and have no idea what a 'typical' Piemonte chocolate dessert is like, but to me this was anything but ordinary. In consistency, it was somewhere between jello and mousse. In flavor, it was sort of like Nutella with amaretto - chocolatey hazelnutty almond scented deliciousness. Need to go back soon, even if just for this dessert alone. So, my picks out of the dineLA items tasted? Sliced veal, Peruvian potato ravioli with black truffle, and bread pudding, hands down. And with the Amex foursquare sync/check-in, I got an extra $5 statement credit which renders my total lunch bill at $22-$5= $17!!!! For a 3-course meal that involved truffle!!! In an elegant space with awesome service! Plus I got hotel points by using a credit card associated with a hotel loyalty program, and 100 points for making my reservation with OpenTable. For those who work in the Valley within driving distance - you've got 4 more days to go for dineLA - don't miss out on this one! Fact: Susan Feniger did not invent Kaya toast. I know that may be a little hard for some to accept, but so are many things in the world that are simply, truth. The original kaya toast was invented by a husband and wife team in Singapore: Ah Koon was an enterprising young man who arrived at 15 years old to Singapore as an immigrant who did not know anyone. He started as an assistant at a coffee stall, learned the trade then saved to open up his own in the 1940s - an inspiring tale of tireless hard work, endless optimism and passion for serving good food to the community. He eventually married and his wife perfected a homemade mix of egg and coconut to be spread over her husband's charcoal-grilled toast. Ya Kun is apparently what the coffee stall's name evolved to as sounding similar to the owner's name. Kaya, as the spread is called, quickly became the stuff of legend - and Ah Koon and his family built an empire of coffee stalls with the same cozy, neighborhood food stall vibe only now with dozens of locations all over Singapore including many franchises. On our holiday trip to Singapore, we were lucky enough to find that there was a Ya Kun Kaya Toast stall right across from our hotel! It was a quick service set up: you order at the counter, find yourself a seat, and they call you when your food/drinks are ready. You can order a la carte or breakfast sets - we chose to go with the Kaya Toast breakfast set ($4.50SG ~$3.60US) that came with a stack of toast with butter and kaya spread, 2 'soft-boiled' eggs that are really more like poached, and a hot drink. The toasts were pieces of thin, wheat bread that are charcoal-grilled for nice smokey flavor which goes really well with the subtly sweet coconut-egg kaya spread. My mom actually reminded me that we used to eat the Hong Kong version of kaya as kids - that I LOVED but had no idea was the now famous kaya! The HK version is made by Yeoh's and is a translucent orange, smooth, light and very sweet. Ya Kun's kaya is more of a translucent golden color, light more subtly sweet. A delicious, nuanced spread that made me fall in love with this version as an adult. As for the toast, I would have wanted more substantial pieces, but these made for a nice light breakfast (on a second visit, I got the french toast which was fantastic). I'm not at all a coffee connoisseur, and on the first visit I got hot Horlicks (a malted drink again a childhood fav in HK, so glad to see that they served it at Ya Kun! ); on the second visit I tried their iced coffee, which had a very fragrant aroma that was a perfect start to my morning. Despite the now huge empire, Ya Kun's slogan somehow still feels very authentic "The Toast that binds...kinship, friendship, partnership". The lovely guy behind the counter (who actually looks like Ah Koon per the photos on the wall, but obviously isn't him) whose name I somehow never got, was super friendly, asked us about our visit and remembered and asked us about Hong Kong on the second visit. If I lived there I could imagine myself going to Ya Kun as a morning ritual! Though the vibe is still very personal and nostalgic, Ya Kun is now clearly a modern company. That prides itself on constantly coming up with new fun ways to serve kaya including Kaya Cheese Toasts, the aforementioned french toast, and butter sugar toast. And an apparent local favorite, kaya on buttered soda crackers. They also have a small merchandise area that sold souvenir jars of kaya in cute little boxed sets, as well as cookies made with kaya butter. One of my favorite things to do when travelling is to fill at least half of my suitcase with local specialty snacks and foodie finds, so that when I get home I can relive the great food memories and hang on to my vacation for just a little bit longer (and to make the return to 'normal' life a little bit more bearable). So, I stocked up on the little jars of kaya (just $6US for two 75gram jars in a cute lil gift carrier!) as well as cookies. Now a few weeks in to my return to LA, I treat myself to kaya spread over toast every once in a while - every bite brings me back to that little coffee stall in Singapore, having breakfast with my parents and as happy and carefree as a 5 year-old again, and that puts a smile back on my face. I hope I don't run out of kaya anytime soon - but when I do maybe I'll finally go to Street for my fix, and to see if their version lives up to the hype. On past visits to the Los Angeles County Museum of Art (LACMA), I had been intrigued by the sleek yet fun Mad Men meets Jetsons meets Art Deco done-in-all-red restaurant and bar in the courtyard - run by the prestigious Patina Group - but never had the occasion to commit to a full meal there as we were always on our way elsewhere. The tasting took place in the Ray's (restaurant) part of the space. Befitting its location outside a museum, design by architect Renzo Piano, and namesake Hollywood producer Ray Stark, the mod decor was artfully done (form) with bold colored furniture surrounded by clear glass offering views of the museum plaza, and touches of unexpected whimsy, like secret pull-out drawers containing linens and silverware (function) This carries through to the skillfully crafted desserts! Chef Josh came by to introduce each dish, and to share personal anecdotes about each which was a nice touch. First up: Coconut ($9) Coconut pudding, coconut macaroon, coconut granita, guava frozen yogurt, calamansi gelée. I LOVE coconut, as a pure and fresh tasting fruit that can be incredibly versatile - and think it's a travesty when people don't know how to go beyond using as those sickeningly sweet toasted shreds. Chef Josh presented three ways to highlight coconut - on the same plate. And used for his homemade froyo, guava foraged from a manager's yard. Loved this dish with its mix of skillfully controlled creamy, light, smooth textures bringing out the best in its simple, few ingredients. My only note is that I wanted the macaroon to be less dense, more airy, with a more delicate 'shell'. Next up: Sticky Toffee Pudding ($9) Date cake, redwine figs, goat cheese ice cream, toffee. The few times I've had this dessert at other venues, chefs had taken the name literally and produced dense bricks of bread pudding smeared with a substance that I can only liken to the consistency of tar. That is difficult to cut through even with a knife, after a few seconds of cooling and hardening, and that makes you reach for water almost immediately. Chef Josh's interpretation is my favorite by far - it's a light, subtly sweet and perfectly sized date cake topped with beautiful figs, and the lightest spoonfuls of sauce. Lovely served with subtly flavored goat cheese ice cream. This is what all other sticky toffee puddings should aspire to be when they grow up. Loved. The next dessert drew audible moans around the table: Chocolate ($10) Dark chocolate mousse, caramel sauce, milk chocolate whipped cream, praline, chocolate sorbet, hazelnut brittle. At first it just seemed like a cup of various scoops of chocolate ice cream - but it soon became clear that each bite was a revelation - there was smooth and creamy at varying levels of cacao and density, giving way to crunchy bits with a hit of saltiness to further amplify the richness of chocolate flavors. Most around the table that night chose this as their favorite of the night - chocolate lovers will definitely not want to miss this. Maybe it was just the mood I was in, or maybe it was some subconscious reaction to having several consecutive courses of dessert, but my favorite that night was the citrus one: Mandarin Budino ($TBD, not yet on menu) a light sponge cake textured bread pudding with tangerines so perfectly ripened it could wring tears of joy with each slice - and the flavors are reflected in the sauce, again with a skillful, light and sophisticated hand. The whole thing is crowned by a beautiful thin dehydrated wheel of mandarinquat (cross between mandarin and kumquat) which provided a nice crisp finish. This dessert was not on the menu yet at time of tasting, but will be made available in February. I think it is at this point that Chef Josh revealed that two of the desserts we had just fawned and raved about, Coconut and Mandarin Budino, were gluten-free! His fiancee is allergic to gluten, so he has found ways to make delicious desserts that are gluten-free without sacrificing taste! I usually don't like foods that are "free" of this and that (e.g. "fat free", "gluten-free" etc.) as they almost always don't taste as good as the 'real' and 'whole' thing - but in the case of Chef Josh's desserts - I would have never, ever guessed that they were gluten-free if he hadn't said it! Mad props! And, fantastic news for food-lovers with allergies! Oh, and almost forgot to mention that there are a bunch of hot alcoholic drinks on offer at Ray's - because I couldn't get enough sugar in my system, I had ordered the Oaxacan Holiday ($12) with cocoa-infused dark rum, creme de cacao, chocolate chili bitters, freshly whipped cream and grated nutmeg. I wanted to love this, but the alcohol was too overpoweringly pungent for me. Just when we were getting ready to thank our gracious hosts, more plates arrived - Chef Josh treated us to plates of "BTO"s ("Better Than Oreos") which are usually served as complimentary treats after a meal at Ray's. True to their name, these cookie sandwiches taste like what oreos could be if they were made fresh daily with high end ingredients and cut way back on the processed sugar. Man of many talents, Chef Josh apparently also makes amazing bread - and we each got a fresh loaf as a parting gift! Now that I know what's on offer at Ray's and Stark Bar, at least in terms of desserts - I am definitely making a point to stop by on my next visit to LACMA! As is our M.O., when on vacation my family typically decides what we want to do, when we arrive - we pick a neighborhood and then let the day take us where it may (with the exception of most of our meals, of course!). 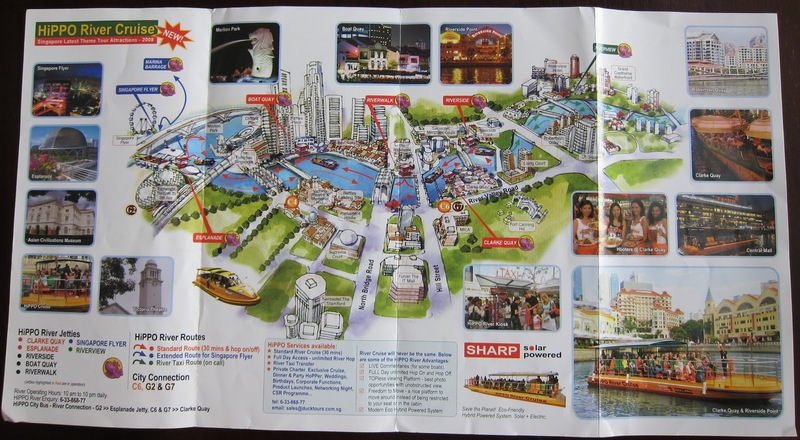 On our second day in Singapore this holiday, we decided to take a stroll around a popular tourist area, Clarke Quay - which lead to a fantabulous all-day adventure on the river as well as soaring 57 stories above the city! Clarke Quay is essentially a strip of restaurants and bars right on the Singapore riverfront (reminiscent of Hong Kong's Stanley in terms of a generally expat / tourist crowd that is laid back and in casual wear) - you can find eateries and bars that are right in line with Singapore's mix of primarily Indian, Malaysian, Chinese and European transplants. And then some American staples and important exports, like Hooters (heavy sarcasm intended) but with local waitresses. While the loudly colored 3-story buildings housing these eateries and bars may look obnoxious - I could imagine this being a fun and convenient place for college kids or young adults travelling with family - and staying at any of the hotels within walking distance - who want to slip out at night in a safe environment. Not being a young adult, but yes travelling with my parents - we brisked past the pubs towards the mall and supermarket at the end of the riverfront walk to stock up on drinks (another reason that makes Clarke Quay a convenient place to stay). Somewhere along the way, we ran across a kiosk selling day cruises down the river - sort of like the Bateau Mouche in Paris, which offers a great way to see key sights in the city in a relaxed, short ride for just $15SG per person. My mom ingeniously also discovered that for $3SG more (so total of $18SG = ~$14US pp), you can use the cruise like a water taxi for 24 hours - with unlimited hopping on/off at popular stops should you wish to take a closer look on foot. I loved the Bateau Mouche in Paris - and was excited about the concept of the HiPPO cruise being similar for the Singapore River. And a building that looks like a cross between an armadillo and a spaceship - that turned out to be the Esplanade Theaters by the Bay. Then for the grand finale - the most breath-taking structure of all, and looks like some modern day Noah's Ark post flood - stranded atop three skyscrapers - Skypark. Apparently Skypark is not some national monument, but the brainchild of some marketing genius behind the Marina Bay Sands Hotel & Casino (which occupy the three towers below the 'ark'). You can pretty much see this structure from anywhere in the city, and it draws people in like some invisible beacon, or moths to a flame. According to Marina Bay Sands, Skypark stretches longer than the Eiffel tower laid sideways, or 4.5 jumbo jets, and the gravity-defying cantilever is one of the largest of its kind in the world. 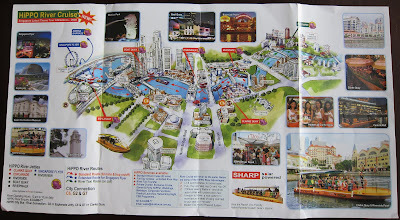 For gamboholics' visitors' convenience, not only is it easy to get to Marina Bay Sands by MRT (Singapore's subway system), taxi or bus, it's also super accessible by boat - there is a dock built right across the street from Skypark, and HiPPO cruises makes its last stop and drop there. Skypark is thankfully open to the public, not just hotel/casino guests - for an admission fee of $20SG=~$16US per adult. The view from the top is spectacular - especially to see the fleets of ships 'taking a break' near harbor in the South China Sea. Folks lucky enough to be able to afford to stay at Marina Bay Sands can also enjoy their rooftop infinity pool, with the spectacular views. The mall was also built to entertain/impress - with a faux 'river' running through the heart and gondolas for rent (yeah it's kind of like the Venetian, Las Vegas). With high tourist traffic due to the hotel and casino - there are many international brands at this mall, even when it comes to eateries. Oh yes, this is where Nancy Silverton's Mozza has its Singapore outpost. We didn't try it as we have one in LA, and we'd rather focus on things from, or that you can only get in Singapore. We stumbled across just such a find in one wing of the mall - a cafe which sat on a boat-inspired structure, suspended above the 'river'. This was a branch of the Singaporean teahouse chain TWG, which treats tea as an art form. The concept is steeped in the history of and celebrates Singapore as a former trading post for tea, spices and gourmet goods. Unfortunately the letters stand for something that isn't as exotic - The Wellness Group - the corporation that runs the business. But we had fun immersing ourselves in a menu so large that the teas alone literally merited a book. Actually, two books - one that was an index of I think over 200 types of tea, and one that had descriptions of these teas that you had to cross reference if you wanted to know what they were. The tea menu did end up a bit overwhelming - so we simply asked the waiter for recommendations. I went with a Fruit Mountain Tea milkshake - made with a black tea with "golden asian fruits" ($11SG ~$9US), SO good but pricey, while my parents went for classic hot teas: Genmaicha and Dragon Well. They also have a great menu of salads, sandwiches and desserts which feature their teas as ingredients - we started with a Seared Foie Gras Salad ($29SG ~$23US) with housemade pan-seared foie gras served on tender spinach shoot salad, caramalized apples and carrots drizzled with Chocolate tea infused vinagrette. Then my dad got a Mango Crumble ($12SG ~$9US) a delicious tart with mango wedges, light coconut cream infused with Vanilla Bourbon tea, topped with crunchy crumble biscuit, and scoop of Alfonso tea ice cream (black tea blended with rare mango). Every spoonful of this was pure heaven with fragrant tea interplaying with fresh, tart mango flavors. My mom got a Bourbon Island Crepe ($14SG ~$11US) with mango marmalade tossed in light caramel sauce infused with Vanilla Bourbon tea and flavored with coconut, lime and vanilla. I took the liberty of dipping my fork into both their plates, plus a Grand Wedding Tea macaron with passionfruit & coconut ($2SG ~$1.50US). The teas, food and space are all lovely though some items were pricey - this was the most delicious and relaxing afternoon tea we've ever had in the middle of a mall (or perhaps any cafe). After catching a cab to dinner at Boon Tong Kee, a restaurant recommended by my uncle - also a foodie! :) - we dragged ourselves back onto the HiPPO boat for one last ride, to capture the nighttime experience and views. I don't know if it's just a case of - almost everything in the city always looks better at night - but we LOVED Singapore from a riverboat after dark. Especially Skypark, which turns into some vessel from outerspace at night - with its crazy looking lights and laser show. All in all, a spectacular day with lots of great memories and 'Kodak' (or shall I say Instagram? Sadly people don't use film/prints photos anymore) moments, for relatively little money - loved it! Shanghai No. 1 Seafood Village - Siren Call for Modern Chinese FineDining in the SGV? I admit, I'm a sucker for the full experience when it comes to dining. Breath-taking decor can't make up for poorly made food, but I'm greedy - I want great taste in both. This perfect balance is prolific in higher-end Chinese restaurants in Hong Kong, and I've been wanting to find a place of similar caliber in LA. That isn't a frenetic, sensory assault chamber gilded in red and gold and/or almost visible congestion of soundwaves - with waiters yelling over busboys clattering dishes over a sea of humanity, sharing their latest at their loudest, or dodging metal carts chock-full of that which can maim or at least seriously burn. And serves quality dim sum. Freshly back to LA from a Hong Kong/Singapore trip, and just starting to miss all the great eats, I was excited to hear, via Sinosoul, of a newly opened restaurant in San Gabriel that may fit the bill for good food in a modern fine dining setting - Shanghai No. 1 Seafood Village (opened 12/18). Apparently they are a new outpost of a successful restaurant chain in Shanghai, 上海1号. My friend 'Designer' and I went to check it out for dim sum today, before word of mouth packs the place and makes it tough to get a table. Shanghai No. 1 is on the top floor of a small mall: Life Plaza Center. From the ground floor looking up, there was not much to impress. But then we stepped inside the place, and it was breath-taking. Walls tastefully done in lush, dark red, with the space sectioned off into cozy rooms with spacious hallways, and a modern take on traditional Chinese carved wood partitions. With chandeliers crowning each room, carefully arranged with Marie Antoinette worthy styled chairs in silver and royal blue, and ornate gold-leafed dishware. Which somehow works with the antique Chinese furniture in the hallway and vintage black & white photos from Shanghai. Designer thought the place made her feel like she was on a ship, and I agree - the decor did evoke some modern retro Chinese luxury ocean liner. We got there around 1pm and got seated within minutes. Great start on service. Slightly marred by the comedic mess up of having our table set the wrong way (knee-height bars made it really uncomfortable to sit) - though our waiter mistakenly told us the table was bolted down, we were fine after we rotated it ourselves. Then first things first - the tea order. On my recent trip, I developed an addiction to Chrysanthemum Shou Mei - 菊壽 -a white tea mixed with dried chrysanthemum flowers - and was impressed Shanghai No. 1 served this (not every place does). White tea is low in caffeine, and high in anti-oxidants, while chrysanthemum is said to ease sore throats or cool down 'hot' chi from eating too much fried food. A perfect pairing for an indulgent meal of dim sum. But that's not why I love it - light and refreshing, with lovely, nuanced floral sweetness, it tastes as beautiful as it looks. Nice to see Shanghai No. 1 doesn't skimp on tea - it's loose leaf with real, whole dried chrysanthemum blossoms. Next order of business: food. Typical to higher-end dim sum houses, push carts have been replaced by a la carte menu sheets that you check off and hand to the waiter. This makes for less chaos, and ensures your food is as fresh as possible. Pricing is also easy to figure out - cost is by 'size', notated next to each dish: (S)=$1.98 (M)=$2.98 (L)=$3.98 (SP)=$4.98 (KITCHEN)=$6.98. Not too bad for a fine-dining space! I was excited to see some dim sum classics with a twist - though for non-Chinese readers the English translations can be really confusing. Designer knows her dim sum, but even for her it was hard to figure out which was which from menu titles. For items with confusing names, I have noted both proper/familiar names and what Shanghai No. 1 calls them for reference. First up: Abalone sticky rice w/ lotus leaf 鮑魚糯米雞 (L) - a dim sum staple, glutinous (sweet) rice is steamed with preserved sausage, bits of chicken and soy-based sauce while wrapped in lotus leaves, which impart fragrant flavor to the mix. Shanghai No. 1 upgrades theirs with a piece of abalone - a small but substantial piece (top left in photo) with nice distinctive taste and fresh, softly chewy texture. To those that would complain about size - it's actually very reasonable - with 3 pieces to a steamer tin costing under $4 total. One of my favorites of the meal as the rice had great perky yet cohesive texture, and the ratio of rice to filling was perfect. Another classic, upgraded is Deep fried taro ball 蝦巢炸竽角(M), usually half the size, quenelle-shaped, and filled only with taro paste. S#1's (abbreviation mine) version: giant puffs of beautifully fried wisps of flaky dough in coral-reef-like formations, surrounding taro pieces with veggie filling. While the fried dough exterior was perfect, it took a bit of work to cut through the center with my chopsticks (the taro was a little bit hard and chunky). I still loved this though for the gorgeous presentation and the texture/taste of the fried dough. Shrimp Dumpling (aka Ha Gow) 晶瑩蝦餃皇- a dim sum staple that also serves as a great basis for comparisan between restaurants (as all dim sum spots would have this dish). The shrimp were plump, but not necessarily fine-dining quality (i.e. live). These dumplings at the best places will have a 'crystal clear' wrapper that is soft, pliable, delicate and thin yet do not break open when picked up. S#1's wrappers left us a bit wanting, as it was 'cloudy' and slightly too thick and mushy around the edges. They were also not uniform in shape /size - not a big deal but another indicator of craftsmanship if they want to be perceived as a true fine dining venue. If memory serves correctly, these are better than Elite's, but not as good as Yank Sing's. Next up should have been a sure-win given the restaurant's name and place of origin: Xiao Long Bao aka Shanghai Dumplings ("Steamed Shanghai juicy pork bun" 上海小籠包 on menu) (M). These "little basket buns" are another way to see the chef's skills - it's no easy feat to get the round of pork, surrounded by hot broth, sealed into a dough wrapper that must be thin and yieldy, yet strong enough to retain its fillings when plucked from the steamer tin. We were disappointed to find that the XLB we got - that should have been plump little bundles of brothy, porky bliss - were emaciated, with dry wrappers, not much broth, and barely any meat. The photo kind of says it all. Steamed rice noodle with shrimp 甜豆鮮蝦腸 (L) - the flat sheets of wide rice noodles had really great, fresh texture - and the shrimp were again plump but not as incredibly fresh as they could be (a little mushy around the edges). The twist here is the addition of sugar snap peas, for a lovely pop of green as well as a pleasing crunch of sweetness that works really well with the more subtly sweet/savory shrimp and soft rice noodle. Fab topped with sesame seeds and dipped in soy sauce. Po Tat aka Portugese Egg Tart ("Baked egg custard" 蛋撻 on menu) - this is the classic dim sum dessert, egg custard tart but done Macau style (Macau has large Portugese history/influence) with the top of the egg custard bruleed. We loved these little tarts, with its smooth, sweet egg custard amped up with the slight caramelization on top, surrounded by a beautifully buttery, flaky crust. All served fresh at just the right temperature, as if straight out of the oven. LOVED. Though the dishes were inconsistent in quality, I didn't really want the meal to end - but was glad we could finish with a dessert that you don't see at every place: Mango Pomelo Coconut Sago Soup 楊枝甘露 ("Fresh fruit w/ tapioca" on menu) (L) - sweet/tangy soup served cold, with bits of mango, pomelo and tiny tapioca balls (sago) in a sweet coconut base. This is usually one of my favorite Chinese desserts - so I was excited that S#1 served this. Overall it was delicious, but when I've had this in Hong Kong, it's usually in a mango coconut base and is golden in color (both base and pieces of mango and translucent white pomelo reflecting base color - hence the poetic words that phonetically sound like 'sunny branch, golden dew' in its Chinese name) - and S#1's version leans much more towards coconut, is less nuanced, and the pieces of mango are tiny (so small you can't really tell if they're fresh - but there were several pieces that were so hard I took them out). The sago was soft and fresh tasting though, and I liked the visual effects of the bursts of grapefruit red. Also of note: besides dim sum staples they also have on the lunch menu other Asian specialties like 南洋肉骨茶, which I thought was a Singaporean item (Bak Kut Teh) but is listed with English translation "Malaysia style pork rib tea"; and 星洲沙米 which I think is a Hong Kong invention generally known as Singapore Fried Noodles, which is listed as "Malaysia Pan Fry Rice Noodles". In terms of food, it's no Yank Sing, not even close. But we were happy to have a place like Shanghai No. 1 in LA to elevate the Chinese dining experience - they just need to raise the bar a bit more on their food to meet the promise in their decor (and service which was good - waitstaff came by to change our plates several times and kept the tea pot full of hot tea). That said, those rearing to bash and sink it as 'overpriced' food, where you are just paying for decor - our meal cost a total of $28.12 for the two of us, and we left stuffed plus takeout boxes. So not really that bad at all. It's an upscale place where you can bring visiting relatives, have decent dim sum (for the most part - and it's just over a month old so finding its groove) with attentive service, and actually be able to hear and hold conversation - my parents could enjoy the space. I've also read a bit about their gorgeous magazine style, beautifully photographed dinner menu (now standard with upper mid-tier restaurants in HK, presumably to entice bigger, impulse orders) and look forward to checking it out at some point, hopefully soon.